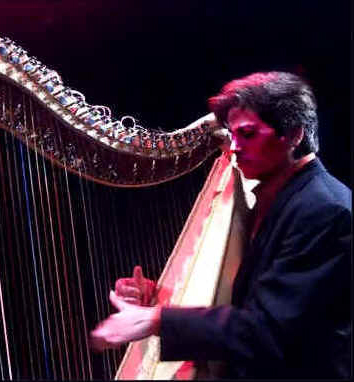 Ricardo García-Curbelo is an innovative performer with professional experience of the stage since a very young age and he is one of the most experienced composer-performers of today’s Latin American harp music. His artistic field embraces the stage from radio, television and film documentaries to educational institutions, private functions, charity performances and concerts. His virtuosity, enhanced by the impressive sound response of his unique Modelo Corvado harp keeps taking audiences by surprise. His vibrant and romantic compositions along with colourful traditional melodies, have added a unique, sparkling touch to many beautiful and memorable wedding receptions.